The New York World’s Fair of 1964/1965 celebrated its 50th anniversary on April 22, 2014. The theme of the Fair was “Peace Through Understanding,” dedicated to “Man’s Achievement on a Shrinking Globe in an Expanding Universe.” In this body of work Taylor creates a Fair that could have existed by creating and photographing dioramas and miniatures using toys and objects that time period and that relate to fair themes. The memorable icons that Taylor remembers seeing and experiencing at the Fair include the Unisphere, UniRoyal Tire’s gondolas, the Antique Car Ride and the Bel-Gem waffles. In this series of images Taylor explores some other ideas of rides and attractions that would never have passed muster in the dusty, smoke-filled Fair Committee rooms of the late 1950’s and early 60’s. 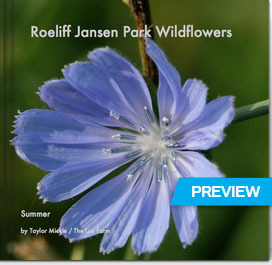 Roeliff Jansen Park Wildflowers. Blurb book.